I couldn’t resist adding another image of the birds hanging out in my yard today. I refilled the feeder with seed, added two more suet cakes, and hung my last birdseed bell, resulting in an increase in avian species. The woodpeckers–including the Red-Bellied version–were out in full force, no doubt enjoying the fresh suet. 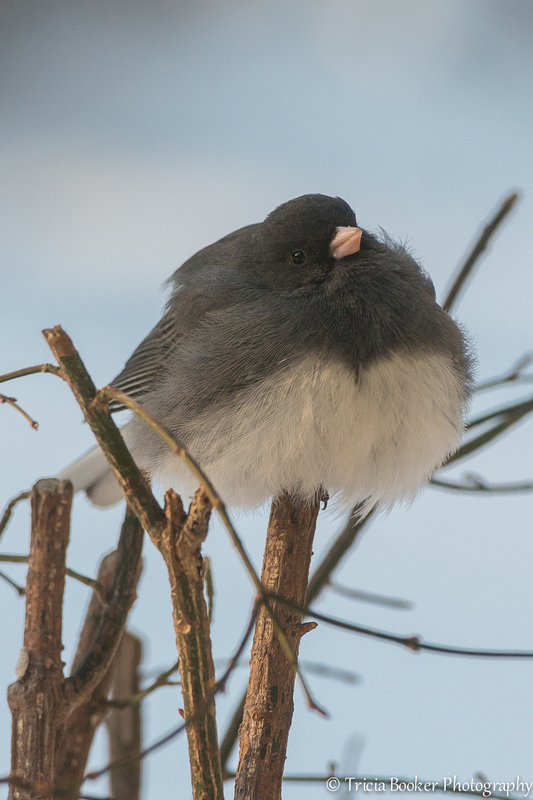 Even the Dark-Eyed Juncos, which usually feed on the ground below the feeders, were brave enough to join the others on the feeders. This bird took a short break, and I caught a quick shot before returning to my desk for deadlines. Tomorrow I need to take a trip to town to refill my stash. The weather isn’t expected to break until some time next week, so I have a feeling I’ll be going through the rest of my bird seed very quickly. I’d hate to lose my daily entertainment to another neighborhood feeder! Thanks Mick! I do enjoy the birds, and with the one feeder about eight feet from my desk (just outside the window), I have a wonderful view as I work. Oh, that sounds like fun! We have an Audubon Christmas Bird Count here in the States. I’ve done it a few times, and it’s great for seeing new species. Yes, sounds like my routine. Wonderful capture of the junco. I noticed the same behavior. The bitter cold has them ravenous. Right now I have six species on the feeder at the same time, all sharing in the new food I added this morning. Downy woodpecker, titmouse, chickadee, Carolina wren, Cardinal and chipping sparrow. The juncos are on the ground underneath picking up the scraps! Sounds like my gang, which also includes bluebirds and a few species of woodpeckers. Found a hermit thrush dining at the feeder in the snowstorm this week.